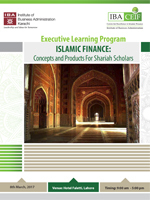 IBA Centre for Excellence in Islamic Finance is pleased to offer a one-day intensive course to provide in-depth understanding of Islamic Financing, Economic & Banking concepts and the related Shariah principles governing Islamic Finance. The course is uniquely designed to provide the participants insights to various elements of Islamic Finance together with the latest practices adopted by the Industry. The course, enriched with case studies and practical exercises, aims to provide a rich learning experience to Banking and Finance. 100% scholarships are available for those candidates who are selected for the program.